A long time ago, at a company far far away… The Atari Years continue. 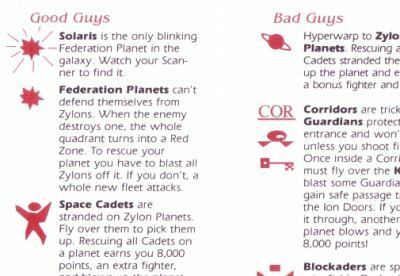 Nostalgically, I was looking over some reviews and trivia about the old 2600 games, when I came upon a review of Solaris. The reviewer liked the game, but what was up with the manual? Which jogged my memory. I had forgotten all about the crummy Solaris manual. See what happened was, after the video game crash of ’83, the Tramiels bought Atari and shut down all the video game operations. Then a couple years later they finally figured out they could make some money off these video game things. Somehow they knew I had a game sitting on the shelf and so they called me up. At the time I was working at Imagen, an image processing/laser printer company, doing some chip and systems design. Anyway, Atari wanted the game, so a deal was struck. I made a few improvements to the game, added some more charts and so forth. Then I handed everything over to Atari: the “master eprom” of the game and my engineering notes. Now the thing about Imagen is that it was one of the early pioneers in desktop publishing, and since I was working there I naturally did my engineering notes with desktop publishing. Today of course, what with Word and Photoshop, this is all routine, but back then I think it was pretty unusual and the guys at Atari were pretty impressed. Engineering notes, in case you didn’t know, consist of a preliminary workup of the game manual, some rudimentary drawings and some technical info. So Atari took all the stuff, happy as clams, and off they went to manufacture the game. But little did I suspect that they would take my engineering notes, almost verbatim, and make a manual out of it, including the primitive little sketches I did. Apparently Atari was cash strapped at the time, but so strapped they couldn’t afford a graphics artist? Sheesh! But I learned my lesson, from then on I submitted my notes in pencil. So there it is, for what it’s worth, the story of the Crummy Solaris Manual. The Pokey Chip Story – A story about designing the Pokey Chip. Atari Star Raiders – Some trivia and remembrances about the Star Raiders game design.